Flammable Liquid Storage is commonly used in many manufacturing operations. They have become a major part in manufacturing processes and large corporations may store hundreds of barrels of flammable liquid storage at all times in order to keep their operations running smoothly. Flammable storage is any substance, liquid or solid, that is easily ignited or combustible. If stored improperly serious fires and even explosion may occur. It is very important that flammable liquid storage be stored compliantly. Flammable liquid storage must be stored in a compliant chemical storage building. Our flammable liquid storage containers are 100% fully compliant and 100% customizable to meet all of your specifications. Offering the strongest and most secure flammable liquid storage containers to give you complete security and safety. Protect your personnel, investments and facility with our flammable liquid storage buildings. Made from heavy-duty, 12 gauge metal steel, for superior strength and reliability. The durability of these buildings is unmatched and provides your flammable liquid storage with complete protection. 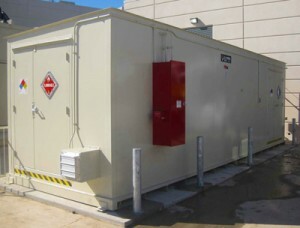 Keep your flammable storage safe and maintained with U.S. Chemical Storage. Contact one of our sales engineers for your expert advice on how you can store your flammable liquid storage compliantly.